Our garden design process begins with an initial visit, which is free of charge, where we discuss your requirements and help you decide which style you prefer. At the next consultation, we present the bespoke design to you and run through our extensive portfolio to help you decide what materials you want for your garden. Should you choose to proceed with the design, a written contract will be provided to represent the entire process from excavation to installation. Once we have finished the work, we carry out an inspection with you to make sure everything has been completed to your satisfaction. Established in 2011, Lindsay Landscapes is a modern, dynamic company and passionate about every element of the work we do. We aim to be at the cutting edge of design, quality and service by ensuring your garden and driveway is stunning and built to last. The Lindsay Landscapes team pride themselves on their high standards, professionalism and attention to detail. We are progressive in our approach, knowledgeable and above all friendly. 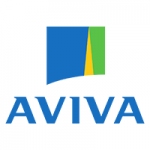 Customer satisfaction lies at the heart of our philosophy and we work collaboratively with our clients to ensure that we deliver their expectations. At Lindsay Landscapes we can either create a bespoke garden design for you, or we will work with your ideas to help you create your ideal garden. Check out some of the bespoke designs we have brought to life in our gallery. 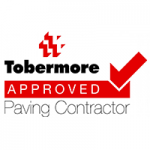 The right driveway will enhance your home, the right shape will transform it and the right workmanship will ensure that it stays that way, that’s why Lindsay Landscapes are an accredited Tobermore Approved Driveway Installer. A Patio that is built to match your needs will add a complete other dimension to your home. Here at Lindsay Landscapes we will create an outdoor living space for your family and friends to enjoy for many, many years. See below what some of our very happy clients have said. Our Garden is simply stunning thanks to Craig and his team at Lindsay Landscapes. 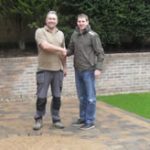 From start to finish Craig was professional, enthusiastic and reassuring that he had the knowledge, ability and accreditation to complete a hard landscaping project to an extremely high standard. Craig took on board our vision for the new garden and came up with the design within days of our first meeting. Attention to detail and workmanship was first class and the communication with Craig throughout the process was excellent. You always knew what was happening at every stage of the project. The boys were also happy to work with us and we had a lot of input during the work. 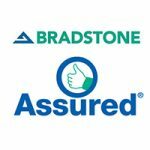 Craig gave us every confidence that he would do a fantastic job and reassured us he would fix the long standing drainage issues and we were not disappointed. The transformation of the garden as well as the finished product is exceptional. We cannot thank Lindsay Landscapes enough for making our garden so special and we look forward to enjoying it for many years to come. 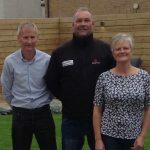 I engaged with Craig at Lindsay Landscapes nearly two years ago with a vision to transform my garden at my home from being basically water sodden waste of space into something that my family could use all year round if required. The dedication, passion and commitment shown by Craig and his team throughout the process from planning to laying the last block was exceptional. After agreeing on the design and works plans Craig and his team got to work, they are the most professional and committed team of professionals that I have ever engaged with. They ensured that the disruption to my family was minimal throughout the whole process and if they said something would be done it was done to the highest standard. I would have no hesitation in recommending Craig and his team at Lindsay Landscapes for any form of landscaping or design work that you may be thinking of undertaking. Thanks again guys!! © 2018 Lindsay Landscapes. Created by Made In Scotland.